PULP Double Feature! The SHADOW and The SPIDER! Above and below are the covers for The Shadow #13 and the Spider #11 (both out in April). Both these series are doing really well, and that's a good thing because they both have strong creative teams behind and they are helping bringing the PULPS back in everyone's hands. Speaking of strong creative team, look for the upcoming THE SHADOW YEAR ONE, written by dear friend Matt Wagner (so you know it's gonna be pretty darn good) and drawn excellently by Wilfredo Torres. And above is a sneak peek at THE BLACK BEETLE NO WAY OUT #2 used as ad by Dark Horse with a series of quotes praising #1 that came out last week and it's pretty much sold out (or close to) everywhere. It's a Great Detective inspired Pulp Sunday with my most recent covers for the new Sherlock Holmes mini - THE LIVERPOOL DEMON - that started this last December. The book - published by Dynamite Ent. - is written by the fantastic - and Holmes veteran - Leah Moore & John Reppion, richly illustrated by Matt Triano with colors provided by Brennan Wagner, and letters by the talented Simon Bowland. Issue 2 will be in stores this month so I thought to give you a round up of the covers for issues 2, 3 and 4 and some quick synopsis (here as chapters) for each issue so you can add to your pull list: it's a great read! Chapter 2: The streets of Liverpool are abuzz with rumors of a demon known as Spring Heeled Jack loose in the city. Sherlock Holmes and Doctor Watson visit the city Bridewell to examine the body of one of Jack's supposed victims but find the officer in change, Inspector Thornton, unimpressed by The Great Detective's reputation. Meanwhile, a collection of mysterious, eldritch Australian Aboriginal artifacts arrive at the William Brown Museum while, in the city's underworld, crime lord Mr. Drummond comes up with a novel solution to the problem of a lost dog. Chapter 3: At William Brown Museum, Holmes and Watson examine the clawed remains of curator Christopher Connor and find themselves on the trail of a mysterious missing object. Inspector Thornton has to deal with the bloody aftermath of crime lord Drummond's somewhat unorthodox approach to dog fighting, while down at the docks a visit is paid to a vessel by the name of Matilda Briggs. Chapter 4: Drummond, now on the run, seeks shelter in Hitchcock's Menagerie, but how long will it be before Inspector Thornton tracks him down? The final piece of the puzzle falls into place for Holmes as he and Watson return to the scene of Tom Christian's murder. Yet the route they take is far from straight and perhaps more dangerous than even the Great Detective could imagine. Time for another PULP Double Feature, this time with two of our favorite (and very old acquaintances here at Pulp Sunday) heroes: The Shadow and the Spider. Above you can see the cover for issue 12 of The SHadow, and below the cover for #10 of the Spider, both issue will be in stores in March from Dynamite Comics. Dark Horse released the above poster as part of a promotional campaign of new "SUPER" titles that are launching this month. Our Black Beetle gets the SUPER NOIR treatment and I love it! Hope you do too. I am so happy to see that Black Beetle #0 (collecting the NIGHT SHIFT 3-parter published in DHP plus extra material) was received so well by critics and fans (lots of BB love on Twitter). Here some of the reviews (click on the links for the full reviews). BLACK BEETLE certainly has the potential to become an enduring “cult classic”, inspiring readers to roll up for more “twisted thoughts” from Francavilla in 2013. 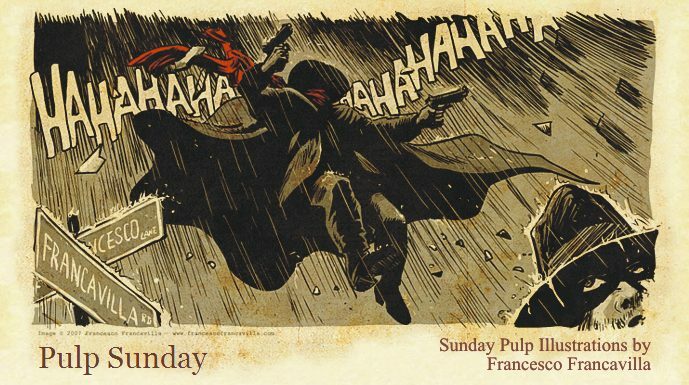 Francavilla truly understands the economy of excellent storytelling, both in character movement and illustrative detail. The Black Beetle: Night Shift #0 is all set up and all AWESOME! Let’s be honest, there’s plenty of pulp heroes running around these days, but The Black Beetle is all sorts of fun. No downbeat, depressing, down on humanity story here, just some fantastic action and adventure! "The Black Beetle" is a delightful slice of skewed madness from one of today’s finest artists. The Black Beetle is Francesco Francavilla’s love letter to the pulp fiction serials of the 30s and 40s. Francavilla is pulling out all the stops to really capture the finer points of the pulp design language, both for the cover designs and the related promo material to create a fully realised design language that is flexible but immediately recognisable. Francesco Francavilla has got a mastery of this universe and shifts us around it expertly. I cannot wait to see where he takes us next! Easily one of the year's best debut issues, The Black Beetle #0 is opening salvo of what looks to be one of the best ongoing series of its kind. The quality of this issue is unsurpassed. The story and artwork flows seamlessly together, a beneficial effect of having a single creative mind at work, and the plot is masterfully paced with no dull moments to be found. There’s something really iconic about every aspect of this book, from the title to his character to the artwork and more. The visuals are superb, heavy shadows and a very simple colour palette. [...] It’s a meticulously created mythos and I’m excited to read the rest. This handsome collection features three Dark Horse Presents stories originally published in issues #11–#13, from Eisner Award winning talent, Francesco Francavilla (Batman: The Black Mirror). Pure masterful pulp at its finest. This buzz-worthy read is as beautiful as action/adventure gets! Through the Black Beetle, Francavilla is able to explore all he loves about classic pulp-noir characters adding his own storytelling sensibilities by writing and drawing a story with no limits. It’s a throwback comic that is worth your time and money. The comic book seamlessly mixes the noir and superheroes genres, is beautiful to look at and, most importantly, it’s super fun to read! This Wednesday, grab The Black Beetle #0, smooth as silk and a reading adventure like you won’t believe. The Black Beetle earns every bit of your reading dollar. FRANCESCO FRANCAVILLA, the incredibly talented artist of BATMAN: THE BLACK MIRROR, totally blows our minds with the first issue of this mini-series that debuts his tribute to the pulp era, the BLACK BEETLE. “The Black Beetle: Night Shift” is a well written pulp comic that is a joy to read from begging to end. It is well written, a page turner and has some of the best art the genre has seen this generation. “The Black Beetle” series and Francesco Francavilla are going places and those places will be huge. It may have been the most flat out entertaining book of the week. Masterfully-illustrated, pulpy adventure! HIGHLY recommended! This is a story of high adventure, where moral dilemmas are pretty black and white, and it's an awful fun adventure to be on. While reading the full color comic, I could practically hear the breathless tones of an old radio drama, or see the Black Beetle as the star of his own Republic serial. There's no doubt about it, boys and girls! The Black Beetle #0 was the best thing I read all week! Clandestine Nazi agents, ancient mystical artifacts and an ice-cool, gun-wielding costumed crimefighter, presented in the comic format with style and aplomb? How could I not sign up for this? Francavilla’s writing is straight forward with colourful characters, pulse pounding action and suspense. Pulp heroes, noir and fantastic art; this might just be the best $3 you spend all week! Using heavy inks, deep colors, and powerful composition, Francavilla brings the fictional world of Colt City to life in style. Artist Francesco Francavilla wears his pulp influences on his sleeve. From his colouring choices, to his sense of panel design, the majority of his work feels like it emerged from the radio drama days of old, when characters like The Shadow and The Spider reigned supreme. And check out more reviews on THE BLACK BEETLE blog!